A few days ago we reported that no less than 6 IP-addresses registered to the RIAA had been busted for downloading copyrighted material. Quite a shocker to everyone - including the music industry group apparently - as they are now using a defense previously attempted by many alleged file-sharers. It wasn't members of RIAA staff who downloaded these files, the RIAA insists, it was a mysterious third party vendor who unknowingly smeared the group's good name. Over the past week we’ve had fun looking up what governments, Fortune 500 companies, and even the most dedicated anti-piracy groups download on BitTorrent. All we had to do is put their IP-addresses into the search form on YouHaveDownloaded and hit after hit appeared. To our surprise, we found out that even IP-addresses registered to the RIAA were showing unauthorized downloads of movies, TV-shows and software. This curiosity was quickly picked up by other news outlets to whom the RIAA gave a rather interesting explanation. 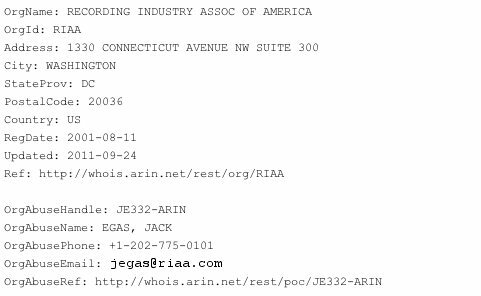 Apparently these file-sharing transactions weren’t carried out by RIAA staffers, but by a third party who’s using the RIAA IP-addresses to share and distribute files online. This is all a bit confusing. First of all, the addresses are not similar, they are simply assigned to the RIAA. Everyone can look that up here, or here. Secondly, while we are prepared to believe that RIAA staff didn’t download these files, we are left wondering what mysterious third party did. Also, is it even allowed by the official registry to register a range of IP-addresses to your private organization, and then allow others to use these IPs? Also, just as a bit of friendly advice, it’s generally not a good idea to let others use your organization’s addresses to browse the internet. This time it’s “just” copyrighted material up for debate, but who knows what else they may be sharing online. Considering the RIAA’s past of suing tens of thousands of file-sharers for copyright infringement, the excuse is perhaps even more embarrassing than taking full responsibility. When some of the 20,000 plus people who were sued by the RIAA over the years used the “someone else did it” excuse this was shrugged off by the music group’s lawyers. Can these people have their money back now? We doubt it. Elsewhere, Henrik Chulu from the Free Culture blog discovered that someone at the infamous Johan Schlüter law firm downloaded the Danish movie ‘Dirch’. But Maria Fredenslund from anti-piracy group RettighedsAliancen had their excuse ready. “We’re working for right holders, who obviously have given us permission to collect their material online as part of an investigative work,” she told Comon.dk in response. c There are 130 comments. Add yours?